Mayoral candidate Brian McHattie hopes to expand his appeal to the suburbs by traveling to nearly 200 neighbourhoods in 100 days. The current Ward 1 councillor is well known in the lower city. But he hopes to broaden that base by going door-to-door in all of Hamilton’s 190 neighbourhoods, he said. McHattie launched his campaign in January, 10 months before the Oct. 27 election, so he could become better known throughout Hamilton, he said. “This is exactly the same thing,” he said. 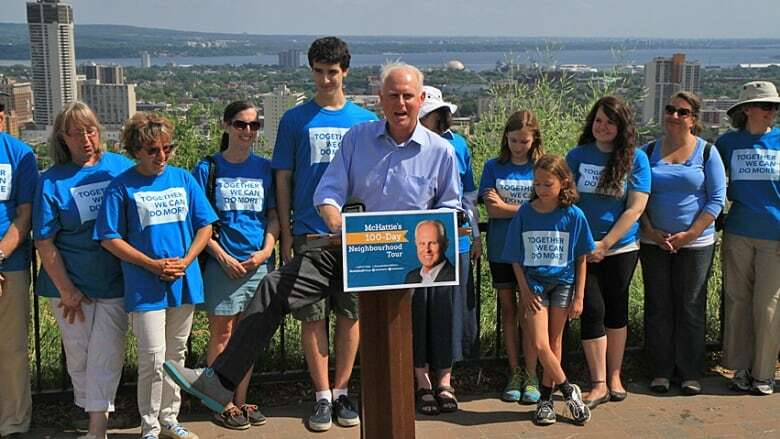 McHattie will knock on doors and hold community events, meeting residents and business owners while wearing a pair of tailor-made shoes bearing his blue campaign colours. With the tour, he hopes to set himself apart from competitors such as Coun. Brad Clark and former mayor Fred Eisenberger. McHattie launched the tour at Sam Lawrence Park on the central Mountain. He’ll travel from rural Flamborough to the city’s industrial neighbourhoods. "It’s not rocket science to suggest campaigning throughout the city," said Eisenberger, who's planning a formal launch in September. "Clearly it’s not revolutionary to go out and visit neighbourhoods and connect with people."